I get a lot of my book recommendations from friends and the Internet. Okay, I get ALL of my book recommendations from friends and the Internet. I heard of this book first on Twitter, and then read a synopsis on Amazon.com before adding it to my reading list. Everyone had such great things to say about The Fault in our Stars. Twitter raved. Amazon praised. The stars were all aligned (pun intended). I mean…it was good. I guess? But had I not read it, I would not have been missing anything. It was definitely no Pride and Prejudice, Harry Potter or To Kill a Mockingbird (my personal favorites). 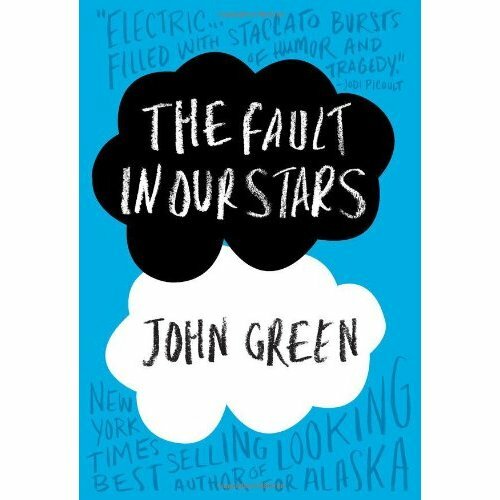 First of all, TFIOS is classified as young adult fiction. Not that that has ever deterred me before – Harry Potter and The Hunger Games could be classified in the same genre, and their writing was impeccable. I’m just letting you know. It’s the story of two teenage cancer patients who fall in love at a support group and who have ridiculously impressive vocabularies (kind of like Dawson’s Creek – y’all know what I’m talking about). They bond over her favorite book, and he gets a wish from The Genies (a mirror of Make A Wish), and uses it to take her to Amsterdam to meet the book’s reclusive author. Life and love take their course. The end. First, the good: It’s a really easy read. It’s a fast read. Now, the not-so-good: The plot is very predictable. I never got really invested in the characters (the author just didn’t make me care about them that much – which I think speaks volumes, as they are teenage cancer patients…I’m not THAT heartless). There are no real highs and lows – it just kind of felt flat the entire time. It’s a good read if you’re just wanting something to pass the time in an airport or on a plane, but I’m sure there’s something you’d enjoy more. Amazon and Twitter – you’ve failed me.